A post about places to eat in NYC should probably kick off with a warning that this is NOT an extensive list. That would almost be impossible. There are SO many amazing places to eat in New York that to try and edit it down to a single blog post is almost foolish. But, having been to New York around ten times over the last decade I’ve picked up a few places I would recommend from delicious pizza, to bottomless pasta or really special fine-dining type meals. So I wanted to try and summarise a few of my recommendations in a post so you can perhaps bookmark or not down some names if you’re heading to the Big Apple anytime soon. This place is the sort of place where you want some tasty food and a good chat. It’s not fancy and it’s not expensive but if you like pasta then you’re in the right place because that’s what they specialise in. They of course have a full menu and from what I could see looked great – it was absolutely bustling with full tables across the couple of floors the restaurant takes up. But the special touch about this place is the $29 wine list (very reasonable by NYC standards…) and the pasta tasting menu. Where you pay one price but get to try a trio of pasta dishes (that change) that are brought around in large dishes and served to you at the table by the waiter. There’s no limit either so you keep going until you say stop/your jeans burst… whichever happens first. A stones throw from busy Times Square (an area NOT really renowned for lovely places to eat) it’s a gem of affordable, social food. Great if you’re in a group with friends. This is one of those very cool places in New York that manages that magic combination of being very cool AND having delicious food. It’s a combination of restaurant, bar and pawn shop. Yes, you read that right – the front is a pawn shop. So you nip through a door at the back to be greeted with the dark and moody bar area, before heading into the restaurant. The couple of times we have been there it’s always been really full of people – from couples having dinner to larger parties celebrating. The food is usually in a slider/smaller sharing portion format and is delicious. It’s pretty much inevitable that you will order more than you need but worth it. My personal favourites were the Salmon Ceviche and Thai Style Shrimp. The cocktails are pretty fantastic too. 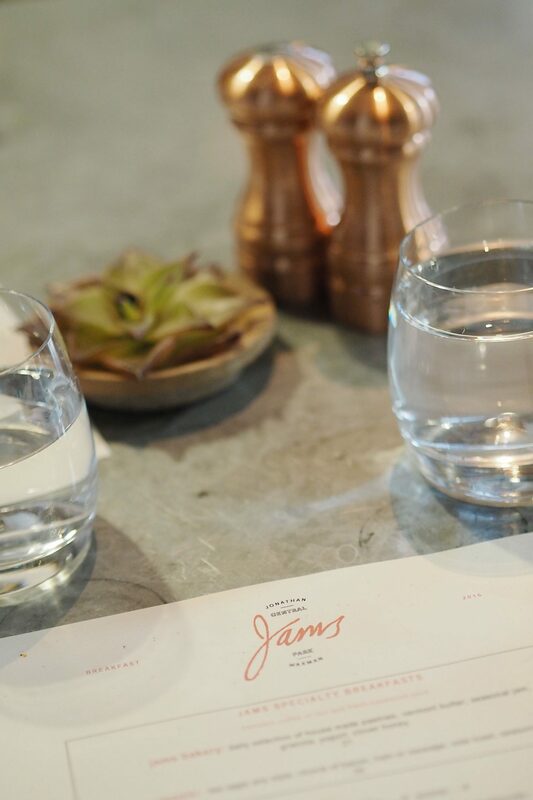 Jams was the restaurant attached to the amazing 1 Central Park Hotel where we stayed in June. This hotel is the most instagramable hotel I’ve stayed in and the location is perfect. A block from central park and right next to a subway line that takes you straight downtown. We found we did a lot of walking, or used Uber when we were heading out but we used the subway a few times for the trips all the way downtown and it’s so quick and easy. On the last morning before we headed home we went to Jams for breakfast. Oh.My.Goodness. Amazing. I had the insanely huge French toast and Zoe had something far healthier. But the food really was so instagramable AND tasty. Think marble tables, copper salt & pepper pots, succulents on tables. All combined with good service (very helpful waiter made recommendations when they ran out of my first choice dish which was the Wild Mushroom Scramble. Sounds delicious and I’ll be heading back there next time I’m in NYC to try it. On the topic of Instagramable breakfast food, I can’t not mention Egg Shop. Which does, as you would expect – excellent egg dishes. 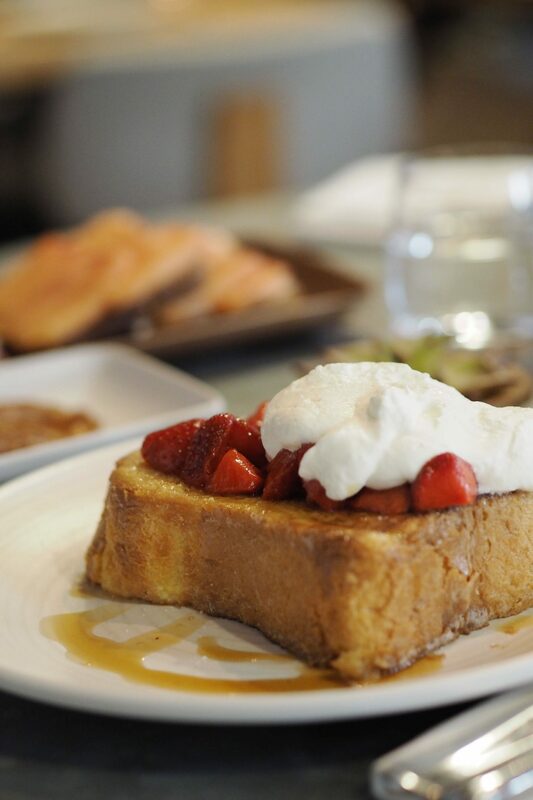 It’s located down in Soho and is pretty small so at peak times (weekend brunch) there’s likely to be a queue. But grab a coffee and head there and wait. It’s worth it. Don’t just expect a poached egg on toast though. It goes beyond that to a whole manner of egg dishes. With sandwiches and ‘cruisers’ – i.e. on bread or in a bowl there’s an impressive range to choose from. Or of course you can do a custom egg dish combining your favourite elements to make your perfect breakfast. I went for the El Camino and whilst it was different to order pulled pork carnitas for a breakfast/brunch…it was GOOD and I would have again. Well worth the wait, and a stroll around busy Soho before/after. When we were in NYC (Zoe and I) we realised that a few blogger buddies were also in the city at the same time so did something VERY rare. 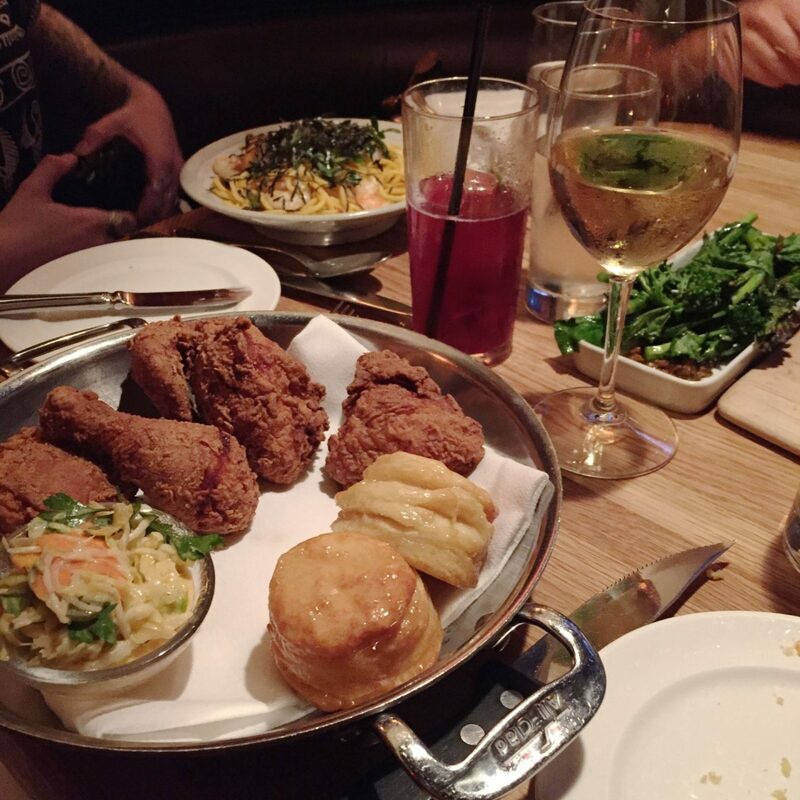 We met up for dinner (no, not that part) and ordered and ate and chatted – WITHOUT it being a massive photo shoot. I know, what was wrong with us?! It was almost like we were there for the food and company over the photo op! But whilst I don’t have a tonne of snaps I can very much recommend the food. Another one down in Soho, which is one of my favourite areas of the city to spend time. 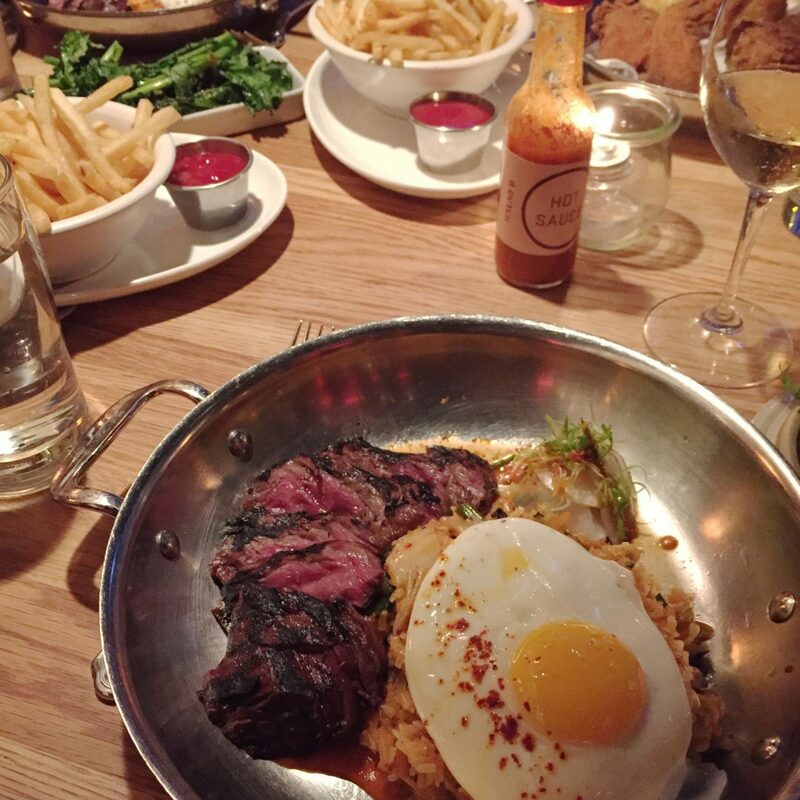 I had the hanger steak with kimchi fried rice and it was delicious. Perfectly cooked steak is always a winner. Oh and the waiters look like models, so that’s always a plus. Lastly, I can’t do a whole post on places to eat in NYC and not mention Ollie’s absolute favourite restaurant in the world. Every time we go we book in here now as it’s such a great experience. From wonderful service to delicious food. They also have some delicious wines – largely from around America – and it’s where I discovered a new favourite (A Riesling from Washington State if you’re wondering…). When we went to New York for Ollie’s birthday a couple of years ago, this was the place we went on the day and whilst we had just arrived so were a bit bleary eyed with jet lag it was wonderful. It’s quite a fancy feeling place, so one for a special meal or a posh feeling date night. But well worth it. Every dish is one of those times were it looks too small but turns out to be a perfect portion of taste perfection. Just writing this I can remember the chicken and sausage main course I had. Which might sound a bit basic but it was honestly SO good. Changed my mind about ordering chicken in restaurants! I usually don’t order chicken as always think it’s a bit bland or something I can make at home. How wrong was I?! This dish was incredible and definitely not one I can do at home. 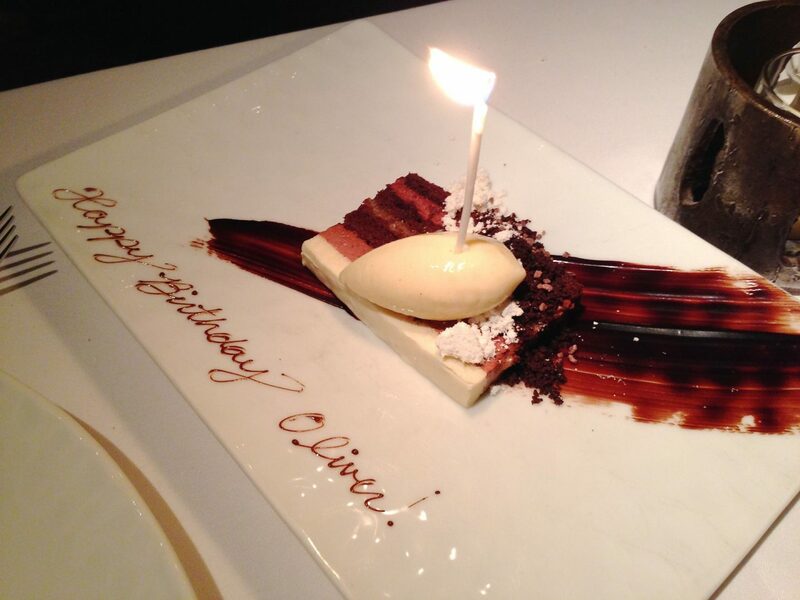 They’re also excellent at the little touches – I had mentioned it was husbands birthday when I booked a table and then with desert they brought out a slice of cheese cake with happy birthday on it. I hadn’t asked for it, they must have just noted it and chosen to do that. 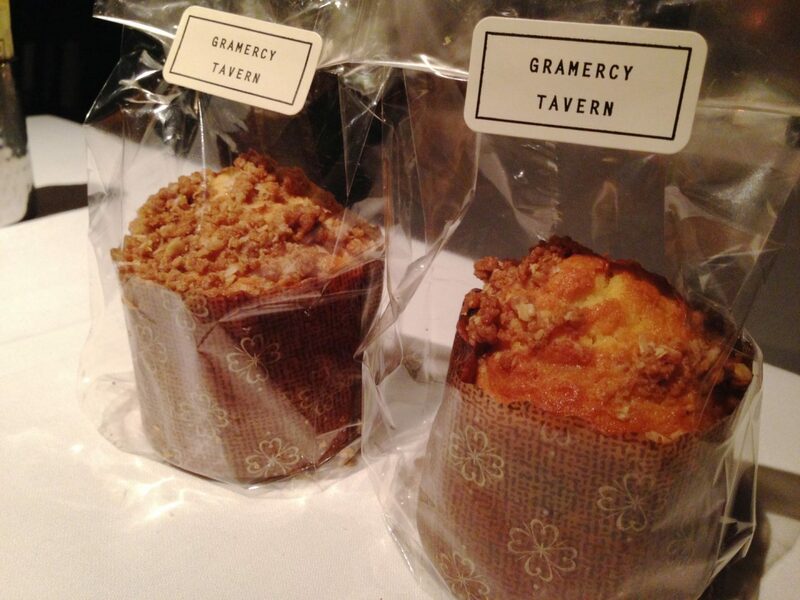 Really excellent and worth the splurge for a truly special dinner in the city. There is also a more casual option for eating here as they have the dining room and the tavern – so you can go for a more relaxed vibe if you prefer. I would recommend the dining room though – this is where we have eaten each time we have been. I could go on with more and more places like The Square Diner on 33 Leonard Street is great for a true diner experience…oh and Momofuku for delicious icecream post-dinner….and you can’t go without having Pizza at Don Antonio on West 50th…the list is endless! But I’ll leave it there for now. If you want any more New York tips or suggestions just let me know. I feel like I’ve racked up a few in 12 years I’ve been going to the city! WOW. I first went there TWELVE years ago. Now excuse me whilst i go and lie down and recover from feeling old. I’m going to NYC in 4 weeks I’ve never been before! Jams looks like an amazing place for breakfast can’t believe the size of your French toast! I need to explore more sushi places! For some reason it’s not something I’ve ever really eaten when there before! Even though I love sushi! The Egg Shop looks SO cute! SO good. Definitely go if you’re in NYC. I came back from NY about a month ago and I didn’t go to any of these places so it goes to show, there really are SO many good places to eat in New York, that’s one of the many reasons why I love it there. I’d love to know if you have any you recommend! It really is endless when it comes to places to eat! This all looks and sound so amazing! This post has made me want to plan a trip to NYC!! I feel the same every time I see my own post!